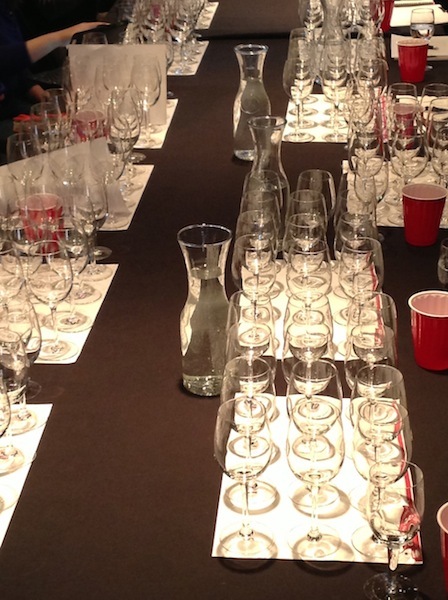 REGIONAL WINE – Do you know why it’s great? Or not? I have tasted slate. It was on a glittering fall day in 2010, high above the Mosel River in the Juffer Sonnenuhr vineyard. My guide: a representative from Riesling producer Schloss Lieser. The river twisted below us like a metal serpent, and as we climbed our feet sent splinters of slate rattling downhill. My guide picked up a stone and handed it to me. I took it, hesitating. It was warm. I put it to my tongue, feeling its texture—not quite smooth, not quite rough. It was—stony, not so much flavor as sensation. It seemed like a kernel of earth. I might plant it and grow a mountain. Later that day, tasting Mosel Rieslings, I tried to link these sensations, to make some sensory-perceptual connection between vineyard soil and wine, between the stone on my tongue and the liquid sliding across my palate. I could clearly taste differences between Rieslings grown in different kinds of slate—red, green, gray—and in different districts of the valley. And I could tell there was also something linking them together, something that wasn’t just fruit. They shared an underbelly, a current, a stratum. You might call it minerality. That’s an elusive but useful descriptor when a wine’s aromas are reminiscent of flint, wet stone, sea air, or dry earth, or when it leaves the impression of salt, chalk, steel, or slate in the mouth. 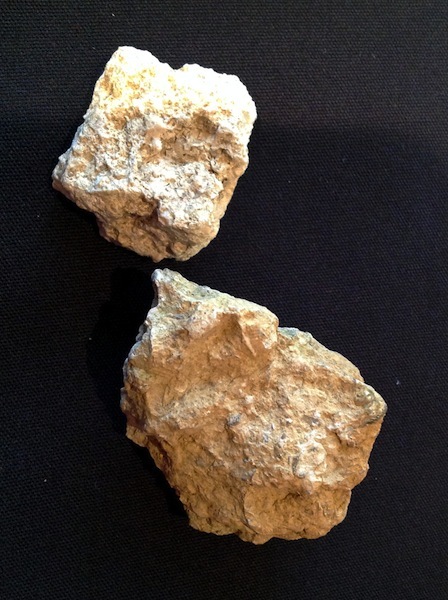 Science struggles with the essence of minerality in wine, but tasters agree that Chablis, say, which has its feet in limestone, produces wine with a chalky aspect. In those Mosel wines, I wasn’t tasting slate, per se, of course. The calculus is more complex than that. 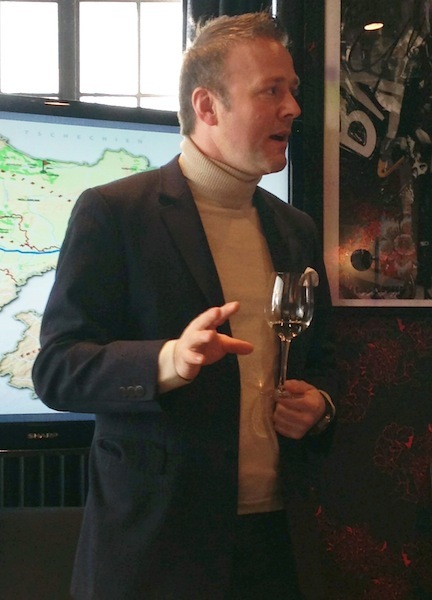 And while I don’t fully understand the phenomenon, that day I learned surely that riesling is a tuning fork for terroir. And so I keep tasting Riesling, trying to figure it out. Fast forward to March 2013. The setting: a swanky event space in New York’s SoHo district. 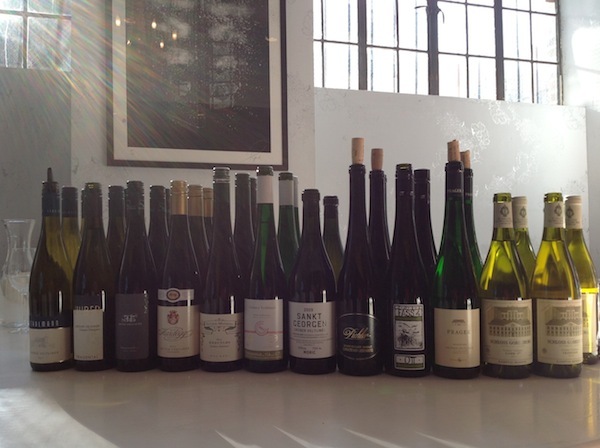 The event: a tasting of twelve Grüner Veltliner sponsored by Snooth Media and Wines of Austria. The guide: Master Sommelier Aldo Sohm. I couldn’t imagine a better Virgil to lead us through the verdant overworld of Grüner than Sohm, a native Austrian who directs the wine program at New York restaurant Le Bernardin. A bit of background on grüner. It’s a native Austrian white grape, a cross between Traminer and St. Georgen, and is that country’s most widely planted vine, constituting over a third of all vineyard acreage. In fact, Austria grows as much grüner as all red grape varieties combined. It’s especially dominant in Niederösterreich (Lower Austria) and Burgenland. 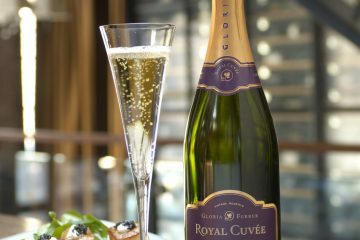 The wine itself is nearly always dry and zesty, characterized by notes of white pepper, green apple, quince, and yellow fruits, including apple and stone fruits like peach and apricot. In recent years this bright, crisp white has become fashionable in the U.S., and is now the wine most closely linked to Austria. As a vine, grüner prefers deep and fertile soils—“It likes luxury,” says Sohm— and has a tendency to overproduce if not managed aggressively. It thrives in the rich alluvial plains of the Danube in Weinviertel, the heart of Lower Austria. But plush soils don’t always produce the most complex wines, and Grüners from the plains tend to be refreshing with simple fruit flavors—pleasant enough, if unremarkable. Grüner reaches its best expression in the Kamptal, Kremstal, and Wachau districts, and in the bony, steeply terraced vineyards of the Weinviertel high above the Danube. There, lean soils, extensive solar exposure, and a long, slow fall ripening period produce fruit of great concentration and gravitas. Bottle age can add complexity and filigree. Those were the wines Sohm poured for us that day—wines grown in vineyards in which the struggle makes them stronger. I watched him set up. He peered at his notes, carefully attending each tall bottle as if it were a strange and wonderful being. He dispatched the screwcaps with a deft twist, but brought each cork to his nose before inspecting it like a jewel. Many young white wines will fall apart with decanting, their delicate aromas dissipating quickly with exposure. Not these. By the time the tasting got underway, many had been open nearly an hour, yet they seemed beautifully articulated. Most continued to flower open over the course of the next hour, too, mingling exotic perfume with chiseled structure. Mysteriously, they still felt fresh and cooling at room temperature, perhaps because of their brisk acidity. Each seemed to sit on my tongue like a cold nickel. Sohm focused his accompanying remarks on terrior, noting wines deriving from vineyards rooted in limestone (calciferous rock), gneiss (banded metamorphic rock), loess (compacted windblown sediment), or silt. “Soil is the origin of the wine—where it’s from, where it’s begun. That’s the home,” he said. Sohm’s bias was evident: fruit for the Sohm & Kracher wines derives from vineyards with limestone soils. Each of the twelve wines we tasted was indeed distinctive. Some were broad and spreading, with yellow peach and apricot aromatics. Others were briny or green, with a diffuse, delicate herbaceousness. But there was something else underneath, a running vein linking them together. Could this simply be the taste of the grape itself? Taste limestone soils. Let’s let that sink in a minute. What does it mean, really? Is the beautiful complexity of these wines primarily attributable to site? 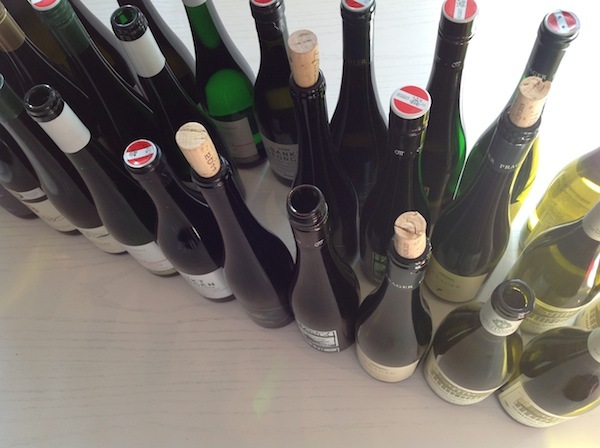 Is grüner veltliner, like riesling, a tuning fork for terroir? What does “limestone soil” taste like? Maybe Aldo Sohm knows. I don’t know yet. But as with Riesling, I plan to keep tasting Grüner, trying to figure it out. Ott-Bernhard Grüner Veltliner Wagram Fass 4 2011 ($26) – Salty, savory nose, but the palate presence is spreading and full. I found it charming; Aldo Sohm called it “comforting.” Biodynamically produced. Soils: A mix of gravel, loess, and gneiss (Wagram ). Schloss Gobelsburg Grüner Veltliner Lamm Reserve 2011 ($62) – Super floral, with a perfume of spring flowers complemented by a refreshing zing at the end. Soils: Loess (Kamptal). Ebner Ebenauer Grüner Veltliner Birthal 2011 ($19) – Grassy, with aromas of celery. It tastes like celery, too, or dill seed. Soils: Loess and loam ranging in texture from dense to sandy (Weinviertal). 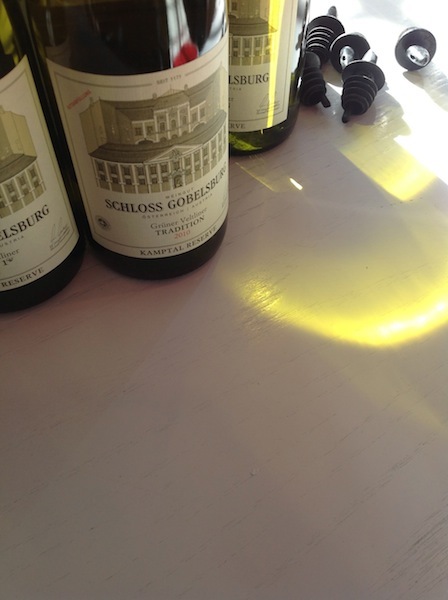 Schloss Gobelsburg Grüner Veltliner Tradition 2010 ($50) – Peachy, with pineappley, honeyed aromas. It tastes of beeswax, but with great savoriness and body. Soils: Loess and sand (Kamptal). Veyder-Malberg Grüner Veltliner Kreutles 2011 ($30) – Organically grown. Oily aromas, broad and spreading. Lots of minerals on the palate, with a zip at the end. Grown at the foot of the hilly Loibenberg district skirting the Danube. Soils: Loess and clay interspersed with gneiss (Wachau). Prager Grüner Veltliner Achleiten Stockkultur 2011 ($90) – Wildly apricot, almost dried apricot, aromas. The zing hits here mid-palate. Very rich. This wine’s from an old site, planted in 1938. “Stockkultur” means that the vines are trained to a single supporting post, because the steep and uneven terraces cannot support a wire-trained system. Soils: Rocky with silty loam (Wachau). F.X. Pichler Grüner Veltliner Smaragd Dürnsteiner Liebenberg 2011 ($75) – Tropical fruits, citrus, stone fruits and yellow peach. Silky texture with a long finish. Soils: Lean and meager mix of gneiss and mica schist (Wachau). Weingut Markus Huber Grüner Veltliner Obere Steigen 2011 ($22) – Peach aromas with flavors of citrus and tropical fruits. Soil: Limestone with a top layer of sandy loam (Traisental). Stadlmann Grüner Veltliner 2011 ($16) – Soft, floral spring nose with a back note of deep struck stone. Super clean with great minerality. Soil: Limestone with a top layer of black earth (Thermenregion). Sohm & Kracher Grüner Veltliner 2011 ($38) – Aldo Sohm’s own wine, his second label. Yellow apple and peach aromas. Fresh feeling. Soil: Limestone base with gravelly topsoil and sandy components (Niederösterreich). Graf Hardegg Grüner Veltliner vom Schloss 2011 ($18) – Soft and broad, but with great acidity. The wine is organically grown, supplemented with biodynamic practices. Soils: Calciferous sedimentary rock with considerable sand (Weinviertal). Moric Grüner Veltliner St. Georgener 2009 ($49) – Salty nose, sweet sea air, and mineral notes, but it is also remarkably broad, with oxidative notes. Great acidity keeps it balanced. A big, big wine. Soils: Chalk (Burgenland). 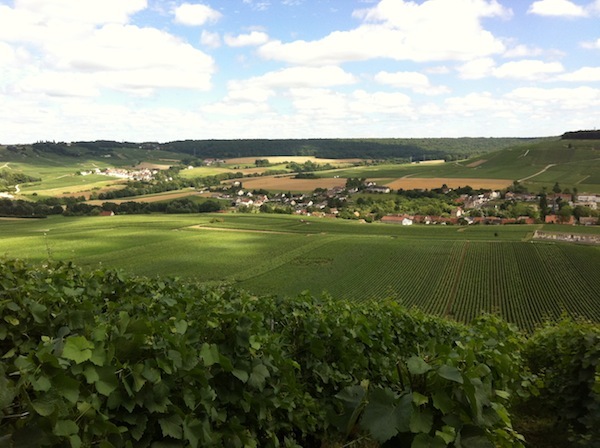 Terroir in Champagne: Will Terroirists Kill the Blends? Another thoughtful and well written article. Thanks for promoting Gruner Veltliner, truly an incredibly versatile varietal. I hope you’ll write more about Austrian wine! Regarding the Stadlmann Gruner Veltliner, this family has been making wine since 1780 and they are certified organic in Austria (the greenest country in Europe) and they practice bio-dynamic methods. They make beautiful wines; their signature varietal is Zierfandler, one of the most historically important varietals of Austria and almost exclusive to their wine region, the Thermanregion. In fact, Stadlmann’s top wine–Zierfandler Mandel-Hoeh is also one of Aldo Sohm’s favorites. Thanks again for the ink! Thanks so much for your kind remarks and the additional information on the Stadlmann. As you may know, I’ve written previous Palate Press columns on Austrian reds and Zweigelt in particular. With summer upon us, it seemed high time to give Grüner its due. Indeed, and reading your Palate Press columns are always a pleasure. All the best…T.